World Premiered at 2016 Sydney boat show in July, the new Riviera 4800 Sport Yacht appeals to a wide spectrum of boating enthusiasts given her design an innovation, and most certainly will excite a new generation to enjoy Riviera’s luxury life afloat. The 4800 Sport Yacht is a replacement of Rivera's first IPS pod powered boat the 4400, and features a two staterooms and two bathrooms internal layout. Her European inspired external design takes cues from the Riviera 6000 and 5400 models. 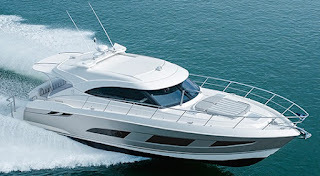 The 4800 has all the Riviera Sport Yacht hallmarks sleek styling, leisurely single-level living on the main deck. For the 4800 Sport Yacht, Riviera introduces a robust and responsive modified Vee hull that perfectly matches the Volvo 550hp or optional 600hp with IPS pod propulsion.